When a new manager comes into a club there is normally a settling-in period where the fans will allow a certain amount of grace. It's now however approaching eight months since Pat Fenlon walked through the doors at Easter Road and the voices from the stand are looking for an improvement. And who can blame the Hibernian fans? In the past 12 months the home support watched only four victories. One of those was against Berwick Rangers in the League Cup back in August. On top of that they had to endure the torture of a Scottish Cup drubbing from their closest rivals that will be difficult to erase from the memory. But with the new season comes new hope. 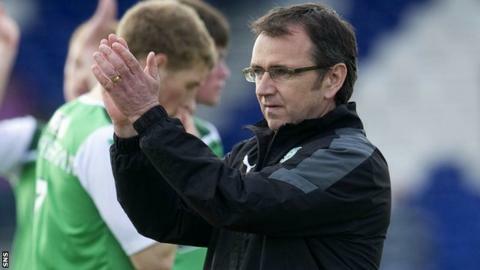 When Fenlon arrived he established very quickly that many of the players on the club's books were not good enough. He dabbled away in the 'loan market' but even the most experienced of managers would have found it difficult to put a successful team together in such a short time. Despite the 5-1 defeat by Hearts at Hampden the Hibs fans can look ahead with some optimism about the way Fenlon operates. They may not think so but there was a slight improvement in results late on last season. For example, their last seven Scottish Premier League fixtures rendered three victories, three defeats and one draw. It was those wins against Dunfermline, Aberdeen and Inverness that allowed Hibs to retain their top flight status. Compare that to the previous seven matches that resulted in just one win, two draws and four defeats. This summer will be about how former Bohemians boss Fenlon can operate in a 'real' transfer window. There are more players available this summer on free transfers than ever before. There is no doubt that there will be some gems up for grabs. A number of players including goalkeeper Graham Stack, former captain Ian Murray and top scorer Garry O'Connor have been allowed to leave. Fenlon's job now is to find replacements who will not only do a job on the pitch but can also unite fans who for so long have felt short-changed. And work on the pitch begins in earnest on 5 August when Hibs travel to Dundee United for their SPL opener. Follow Brian McLauchlin on Twitter.